C.M.I. Electronic Industries Trading Ltd. was founded in 1988. The Company is ISO 9001-2015 certified, IAI certified, and specializes in giving logistic support. 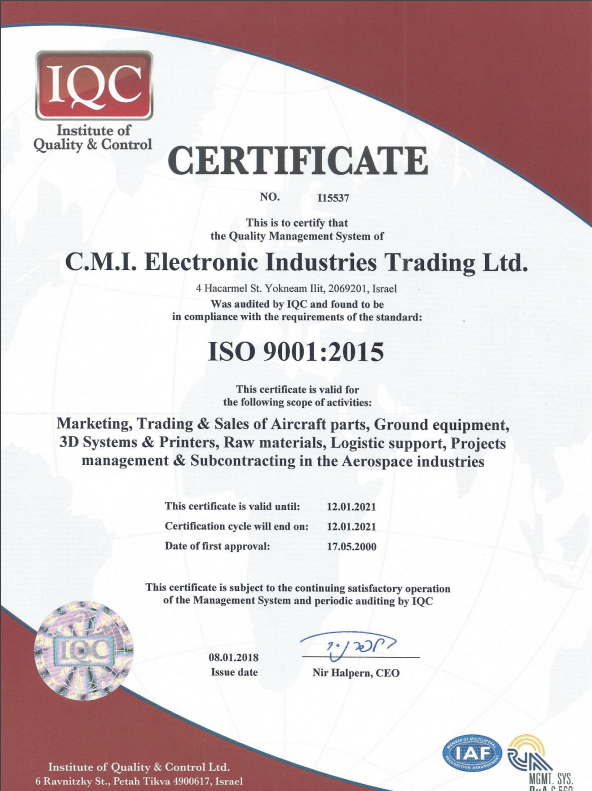 CMI Aircraft Spares & Supplies Ltd. , since 2003 active in the USA in the Aerospace logistic and support. 3D Printing Technology & Systems. Lifting Systems & Ground Equipment. Raw materials, Hardware & Fasteners. 1. Metals manufacturing & machining including high quality metalwork, according to customer's specs. 2. Complex technical projects, according to customer's requirements. 3. Projects' Management tailored to customer requirements. Assistance and solutions for problems in all the above mentioned fields.